September 24, 2011–the day decibel levels went off the roof and ear drums (especially mine) were shattered. Whoever underestimated the collective power of tweens and teenage girls clearly haven’t met the Candy girls. That fateful Saturday morning, I thought I was going to “just another event”. 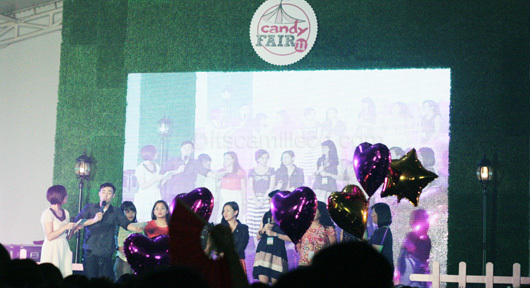 Candy Magazine was holding their 6th Candy Fair at the Megatent. One of its major sponsors, Candie’s (American fashion brand for young girls which I walked the runway for last Philippine Fashion Week) invited me to be their Candie’s girl at the event. When I got to the venue, the place was already packed! I haven’t even reached the Candie’s booth and, already, I’ve met so many Candy girls! 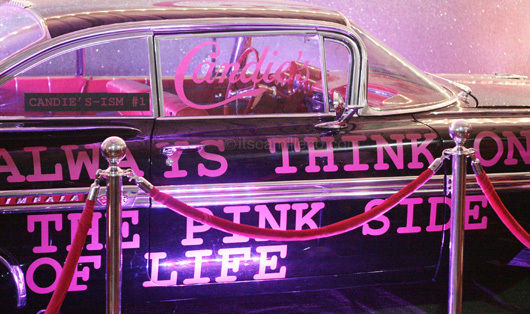 A car inside the Candie’s booth! There’s a Candie’s-ism written on it too. Candie’s-isms areÂ sayings or mottos Candie’s girls live by. Here it says, “Always think on the pink side of life”. Cute, right? Too bad I wasn’t able to take a photo of the back of the car. There were tons of pink chocolate cupcakes there! I actually ate quite a lot of the cupcakes. They were too yummy to resist! Can you spot another Candie’s-ism? It says, “A Candie’s girl loves to be surrounded by friends.” If you’re wondering why there’s a long line behind it, it’s because Candie’s was giving out free nail art services! The other side of the Candie’s booth was offering glitter tattoos plus free Candie’s shirts with cute Candie’s-isms written on them too! 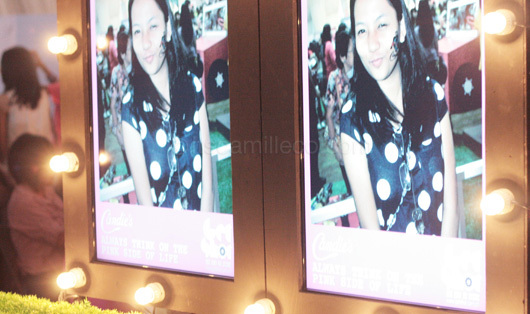 Candie’s photographers were also roaming around the fair to take snapshots of Candie’s girls which were flashed on these huge LCD screens! 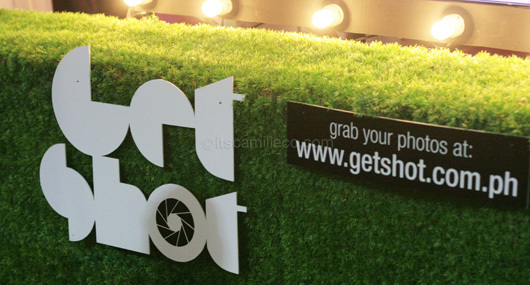 People who had their photos taken can also grab their photos online at Getshot. I’m now switching careers! I’m leaving fashion designing and blogging to become a host! HAHA! NOT. I don’t want to annoy any of you with my tiny tiny voice. These are just a few photos of me while I was onstage, taken by some lovely readers, namely iamkatsays, @joycechos and @iglesiasjane. 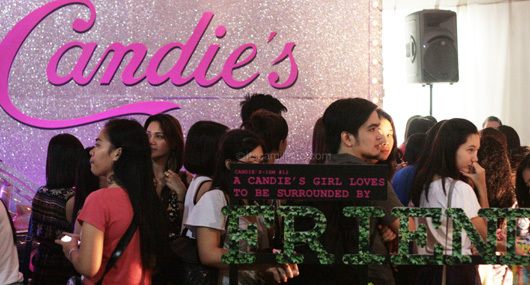 Among my duties as a Candie’s girl that day was to host Candie’s little segment/game. To the group that shouted they love me, thank you sooooo much! I didn’t expect that at all!! You made my little hosting stint all the more enjoyable! Of course this post wouldn’t be complete without my outfit for the day. I wanted to be in theme so I wore something inspired by Candy Magazine, Candie’s and the theme for this year’s fair which is a park. Please excuse my messy hair. These photos were taken after my hosting stint. It was incredibly hot onstage. I melted! It’s also the reason why i took my cardigan off before going onstage. To professional hosts and performers, kudos! I can just imagine the discomfort level you guys go through! You make it look so easy! Hype this look Lookbook.nu here. Thank you Candy Magazine and Candie’s for this wonderful opportunity! I can’t believe this is the first and only Candy fair I’ve attended. I’m definitely looking forward to next year’s! I may be waaaayyyy beyond the Candy girl’s age bracket, but as I’ve said before, I’m still a Candy girl at heart. To the Candy girls, you are the best! You don’t know how much you girls inspire me back. I still get so surprised with all your sweet words and gestures. Please know I cherish them so much. To the Candie’s team, I love Candie’s! You never fail to make me go wow! I feel incredibly honored to be a Candie’s girl.